Giants, in Catalonia, do exist: there are human figures, about three meters tall and they go dancing in the streets every now and then. In Barcelona there are hundreds of them, semi hidden among schools, local councils or parishes. Some of these creatures terrified Nico Alonso (Barcelona, 1992) when he was very young. However, this fear soon became fascination. Today, this the twenty-one year old is the Secretary of the association that coordinates the 32 Giant groups that exist only in Barcelona. We meet at Les Ramblas to and see the Giants that live at the Palau de la Virreina, we visit the copies of the old Giant del Pi at La casa dels Entremesos, a place where are exposed along with many other Giants and figures of beasts, little horses and other Catalan traditional figures. Finally, Nico takes me to meet the original Giants del Pi, sheltered by the entrance of the Church del Pi. 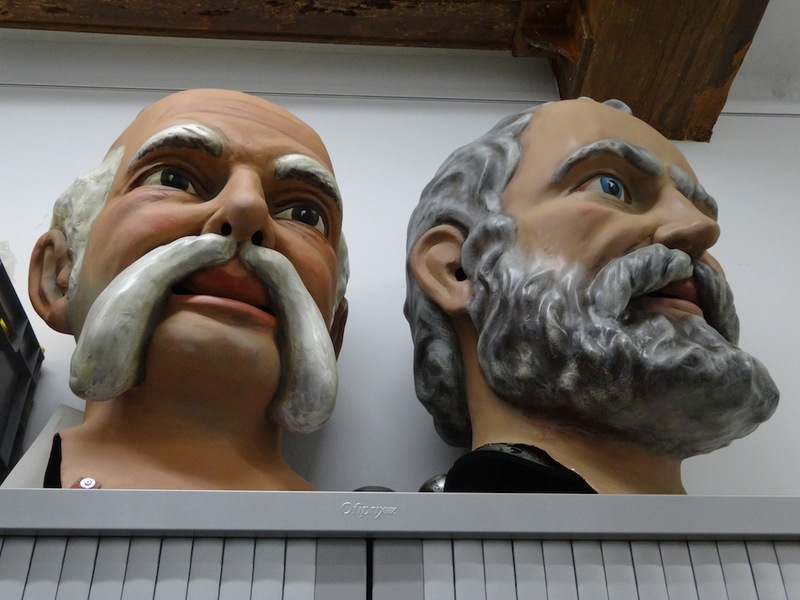 These Giants are a tradition to which many locals have never given any importance beyond the anecdote, but this tradition, today, is more alive than ever. While walking through the old city, Nico tells me about the origin, the past and the present of all these great theatrical creatures. First of all, a Giant is like a very tall puppet carried by a person, the ‘geganter’ (usually a man), that goes inside it and lifts its structure with his shoulders. These giants here are Mustafa and Elisenda, the giants of the Pi, but they are copies, the authentic ones are in the Church of Pi. It is the first time I see the actual face of the Giant del Pi: there is a very popular children’s song that refers to him, but I never saw the real one before. Why is he carrying all those pacifiers in his hand? 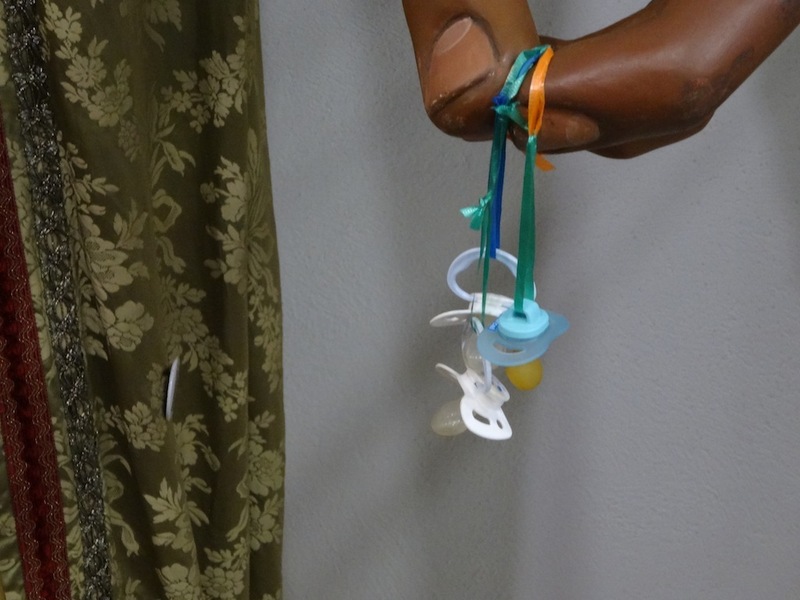 Because it is a tradition: children give him their pacifiers once they become old enough to stop using them. Also, note that the giants del Pi are practically the only ones that are not in fashion of the 18th century or 19th century. In those times different parishes competed in order to have the best dressed ones. When there were no magazines or other media outlets to spread the latest trends. So, these Giants were one of the few fashion references that common people could have at the time. Especially the female giants: all the ladies waited for them to emerge so that they could see how she was dressed, styled, etc. Then, they would go and copy what they saw in her. The male giants, instead, were often dressed in a medieval fashion, with a bludgeon or a spear and the coat of arms that belonged to the parish or the city. The latter is very important as the Giants always carry the symbols of the city or the village to which they belong. It was also quite common to see the female giant beautifully put together and next to her, the male giant wearing, for decades, the same old apparel. It is very interesting to observe how the religion (as you have mentioned that many Giants belonged to the parishes), popular culture and fashion converge in these figures. Yes. Giants traditionally belonged to the parishes because in the old days there was not a clear differentiation between the secular and the religious world and, precisely, parishes also were like a sort of social centres. Besides, the Giants went out to the street for the procession of the Corpus, which was a religious festival. Now days, they go out mostly during the cities festivities that are not religious, but these do not begin until the 18th century. Nowadays you can find giants in parishes, but also in municipalities and even in schools or private houses. There are many children who want to have their own mini giant! But where is the root of the Giant tradition? The earliest references of men on stilts date from around 1320. The first documented giant from all over the world was the giant of the city in Barcelona that dates from 1424. That year, the King came to visit the city and everything that happened, was written down. However, there must have been giants well before that. Their origin is also religious since these represented Goliath in the processions and there was also someone who played David. Then there’s the whole bestiary representing different apostles or characters from legends such as the Dragon that St. George killed, etc. From here, the idea evolved and giants who represent different Kings started to appear. In Belgium and in some other parts of France this tradition also exists, but it is in Catalonia where it has evolved with greater strength. I don’t know what is the reason that made it get so rooted here, perhaps among other explanations, it is because the Mediterraneans love the outdoor culture. It could be. This tradition is closely linked with the Catalan culture, what happened with it during the repression in the times of Franco? Well, many giants were burned or just disappeared during the civil war (1936-1939). Then, during the Franco regime, all the Giants became Fernando and Isabel of Castile. So, they continued to exists under those names. A few years after Franco died (1975), Giants recuperated the names of old Catalan Kings and a new trend also appeared: they also started started to represent popular personalities of the city, from the fish seller of the Barceloneta to the architect Gaudí. In the early 80s, the passion for these tall creatures really became a social movement in which many families participated: lighter giants were made so that women could also carry them and smaller giants appeared for the children, so everyone could have a role and actively participate in their processions. In your case, how did you become so interested in this particular tradiction? As a child, when I saw the giants, they scared me horribly. But then, little by little this fear changed and I started to feelreally drown to them and, by the time I was six years old, I loved giants. My parents weren’t particularly interested in that, but when we saw them in different festivities I just had to follow the pocession. When I was old enough, I joined the giant group (colla) of the Clot neighbourhood and then the colla del Pi. In 2005, when I was 13 years old, I wrote all the text of the book titled ‘Petita història dels gegants i gegantes a Catalunya’ (little story of Giants in Catalonia) illustrated by Pilarín Bayés (Ed.Mediterrània). And now you are the Secretary of the ‘geganters’ coordinator in Barcelona, what is your job in there? The association was created in 1982. You know that Barcelona is actually a set of small villages (districts) and there are giants who belong to each of them. All aspects of popular culture work through associations like ours, for example, there is one for the Devils, for the nativities, for popular dancing, etc. People who work there are voluntaries, they just get involved because they love the traditions and they wish to continue them. What we do with the differant ‘geganters’ (a geganter is the person who manages a giant) is that we help them to organize exchanges and to generate links between the differant gropups that exist in Barcelona. Right now, the giants are in a great moment here. We have 32 groups, there was a moment for the Mercè’s festivities (The patron of Barcelona) where only 24 of them could afford to display their giants on the big parade. The others did not have enough participants in order to do so or didn’t have the means to transport their giants. Right now all the groups are participating! That means a lot. We have 250 official giants in Barcelona, but there are plenty of unofficial ones too. Los gigantes, en Cataluña, existen: son figuras humanas que miden unos tres metros de altura y que salen a las calles en ciertas ocasiones. En Barcelona hay cientos repartidos entre escuelas, ayuntamientos y parroquias. Algunos de estos gigantes aterrorizaron a Nico Alonso (Barcelona, 1992) cuando era pequeño, pero ese miedo se acabó convirtiendo en fascinación. Hoy en día, a su veintena, es el Secretario de la Coordinadora de Associacones de gigantes de Barcelona que se encarga de coordinar los 32 clubes que existen aquí. Quedamos en las Ramblas para visitar a los gigantes de la ciudad que viven en el Palacio de la Virreina, visitamos copias de los gigantes de Pi en la casa de los Entremeses, donde se exponen permanentemente a muchos otros gigantes y figuras del bestiario. Finalmente, Nico me lleva a conocer los originales gigantes del Pi, situados en la entrada de la iglesia del Pi. Los gigantes son una tradición en la cual muchos barceloneses no se han detenido más allá de la anécdota, pero esta tradición está hoy más viva que nunca. Mientras caminamos por el Casco Antiguo, Nico me cuenta el origen, el pasado y el presente de todas estas grandes criaturas. “Los gigantes, en el siglo XVIII, eran uno de los pocos referentes en moda”. Antes que nada, un gigante una especie de gran titere que es llevado por el ‘geganter’, una persona (normalmente un hombre) que desde dentro de la etsructura, la levanta con sus hombros y hace que el gigante camine. Mira, estos son los Mustafa y Elisenda, los gigantes de la Pi, pero son copias, los auténticos están en la iglesia del Pi. Es la primera vez que le pongo cara al gigante del Pi (tan popular por la canción infantil). ¿Por qué tiene todos estos chupetes en la mano? Porque es tradición que los niños que le entreguen su chupete cuando dejan de utilizarlo. Fíjate que los gigantes de la Pi, son unos de los pocos que no visten a la moda, es decir, a la moda del siglo XVIII o XIX. En aquellos tiempos, las distintas parroquias competían para ver cuales eran las gigantas mejor vestidas. Cuando no había revistas u otros medios de comunicación que pudieran transmitir las últimas tendencias, los gigantes eran uno de los pocos referentes de la moda a los que las clases populares tenían acceso. Especialmente la giganta: las mujeres solían esperar a ver cómo iba vestida y peinada para copiarla después. En cambio, los gigantes masculinos a menudo iban aún vestidos de guerrero medieval, con su garrote o lanza y el escudo de la parroquia o de la ciudad. Es muy importante ver como los gigantes siempre llevan los símbolos de la ciudad o en el pueblo al que pertenecen. También era bastante común ver a la giganta muy bien puesta y, a su lado, el gigante llevando el mismo atuendo durante décadas. Es muy interesante observar cómo la religión (has mencionado que muchos gigantes pertenecen a las parroquias), la moda y cultura popular convergen en estas figuras. Sí. Los gigantes tradicionalmente pertenecieron a las parroquias porque antes no había una diferenciación tan clara entre la religión y lo secular, precisamente las también desempeñaban la función de centro social. Además los gigantes salían para la procesión del Corpus, que es una fiesta religiosa. Ahora lo más común es que salgan sobretodo para las fiestas mayores, pero estas no comienzan hasta el siglo XVIII. Hoy en día podemos encontrar gigantes en parroquias, pero también a los ayuntamientos municipales e incluso en escuelas o casas particulares. Hay muchos niños que quieren tener su mini gigante. Pero ¿de dónde sale esta tradición? Las primeras referencias de hombres en zancos que datan de alrededor del 1320. El primer gigante documentado en todo el mundo fue el gigante de la ciudad de Barcelona en el 1424. En ese año vino el rey para ver el cortejo y se escribió todo lo que pasó, pero ya debía hacer algunas décadas que existían los gigantes. Su origen también es religioso, puesto que éstos representan a Goliat en las procesiones y también había alguien que hacía de David. Luego está el bestiario entero que suele aparecer junto a los gigantes y que representa a diferentes apóstoles o personajes de leyendas como el dragón de San Jorge, etc. A partir de aquí los gigantes se popularizan y empiezan a representar a distintos reyes. En Bélgica y en algunas partes de Francia también existen gigantes, pero es en Cataluña donde la tradición ha echado unas raíces más sólidas a lo largo de los siglos. No sé por qué razón se ha arraigado tanto aquí, quizás en parte por el gusto Mediterráneo de estar en el aire libre. Si los gigantes están tan estrechamente vinculados con la cultura catalana, ¿qué pasó con esta tradición durante el franquismo? Bueno, durante la guerra civil desaparecieron muchos, algunos fueron quemados dentro de iglesias o directamente destruidos. Durante el franquismo, todos los gigantes se convirtieron en Fernando e Isabel, así la tradición pudo seguir, de todas formas todo lo que es el folklore regional no fue tan castigado durante el franquismo como se hizo con la lengua. Una vez recuperada la democracia, los gigantes volvieron a tener nombres de reyes catalanes y también se inició la moda de crear a gigantes que representaran personajes conocidos o populares: desde la pescadera de la Barceloneta hasta Gaudí. A principios de los 80, la afición por los gigantes se convirtió en un movimiento social donde participaban muchas familias: los gigantes se hicieron más ligeros para que las mujeres pudieran cargarlos, también surgieron pequeños gigantes para niños, así que todo el mundo podría tener un papel activo en las procesiones. En tu caso, ¿de dónde sale esta afición por gigantes? Me aterrorizaron las primeras veces que los vi cuando era niño. Pero poco a poco, este miedo se fue transformando en un gran interés. Cuando tenía seis años ya me gustaban muchísimo. Mis padres no tenían ninguna especial afición, pero veíamos siempre en las fiestas populares. Me uní al grupo del barrio del Clot y luego al del Pi. En 2005, cuando tenía 13 años, escribí el texto del libro ‘Petita història dels gegants i gegantes a Catalunya’ (pequeña historia de los gigantes y gigantas de Cataluña) ilustrado por Pilarín Bayés (Ed. Mediterrània). Ahora eres el Secretario de la Coordinadora de gigantes de Barcelona, ¿cuál es tu función en esta asociación? La Coordinadora fue creada en el 82. Sabes que Barcelona es en realidad un conjunto de pueblos (distritos) y cada uno de ellos tiene a sus gigantes. Todas las facetas de la cultura popular trabajan a través de asociaciones, por ejemplo, está la de los demonios, la de los bailes, la de los pesebres, etc.. Las personas que trabajan allí lo hacen voluntariamente, por amor y porque desean por continuar la tradición. Nosotros ayudamos a los diferentes grupos para que puedan continuar con esta tradición, les ayudamos a organizar intercambios y que generen vínculos entre ellas. Ahora mismo, los gigantes de Barcelona están en su mejor momento. Tenemos 32 grupos (colles), pero hubo un momento que para las fiestas de la Mercè (la patrona de Barcelona) sólo podían participar 24 de estos, el resto no tenía suficientes participantes para sacar a los gigantes o carecía de medios para transportarlos fuera de su vecindario. Ahora mismo, ¡participan todas las colles! Tenemos 250 gigantes oficiales en Barcelona, pero hay muchos más! Els gegants, a Catalunya, existeixen: són unes figures humanes d’uns tres metres d’alt que surten al carrer en determinades ocasions. A Barcelona n’hi ha centenars, repartits entre escoles, ajuntaments i parròquies. Alguns d’aquests van terroritzar el Nico Alonso (Barcelona, 1992) quan era petit, però aquesta por es va acabar convertint en fascinació. Avui, als seus vint-i-un anys, és el secretari de la Coordinadora de Geganters de Barcelona, que s’ocupa de coordinar les trenta-dues colles que hi ha aquí. 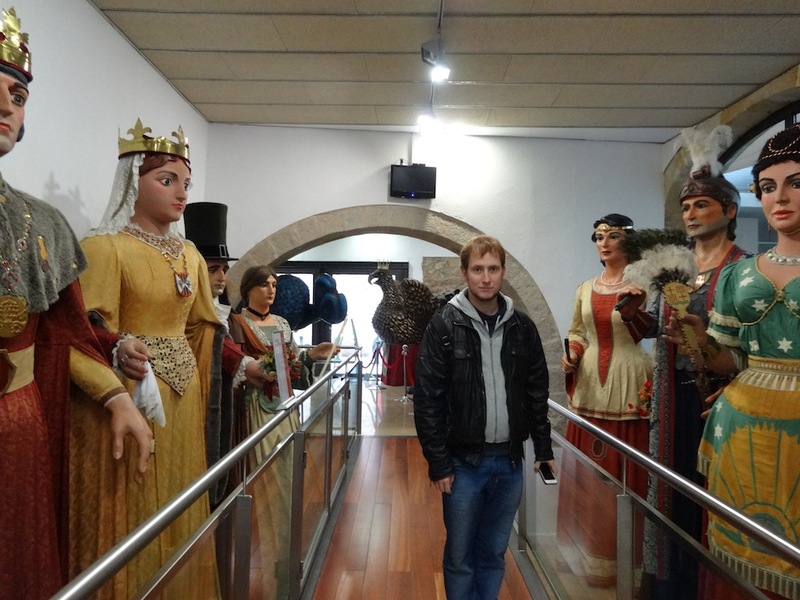 Quedem a la Rambla per anar a veure els Gegants de la Ciutat al Palau de la Virreina i visitem les còpies dels Gegants del Pi a la Casa dels Entremesos, on conviuen exposats juntament amb molts altres gegants i figures del bestiari. Finalment, el Nico em porta a conèixer els originals Gegants del Pi originals, situats a l’entrada de la mateixa església del Pi. Els gegants són una tradició a qual molts barcelonins mai no han donat gaire importància més enllà de l’anècdota, però aquesta tradició avui és més viva que mai. Mentre passegem per la Ciutat Vella, el Nico m’explica l’origen, el passat i el present de totes aquestes grans criatures. 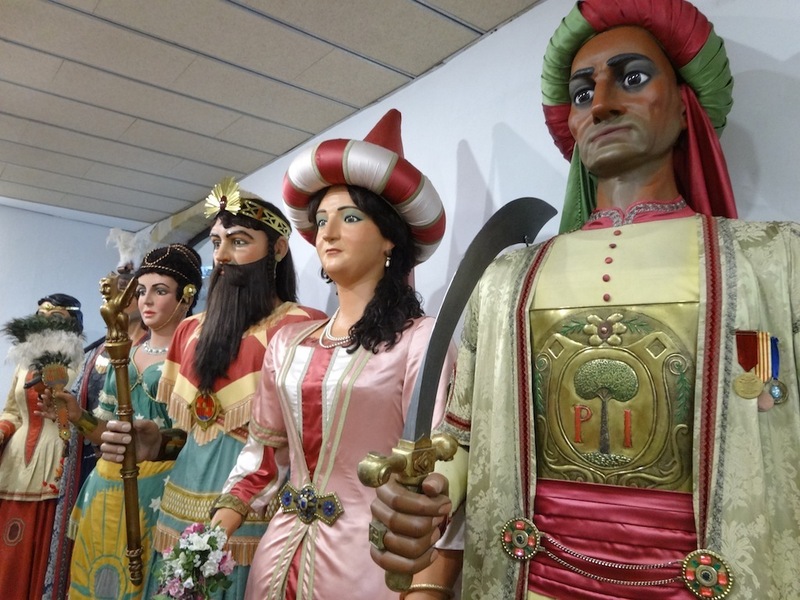 Aquests són el Mustafà i l’Elisenda, els Gegants del Pi, però són còpies; els autèntics són a l’església del Pi. És la primera vegada que poso cara al Gegant del Pi (tan famós gràcies a la cançó popular). Per què porta tots aquests xumets a la mà? Perquè és una tradició que els nens li entreguin els seus xumets una vegada els deixen de fer servir. També, fixa’t que els Gegants del Pi són dels pocs que no van a la moda, em refereixo a la moda del segle XVIII o XIX. En aquelles èpoques les diferentes parròquies competien per veure quins eren els més ben vestits. Quan no hi havia revistes o altres mitjans de comunicació que fessin difusió de les tendències, els gegants eren un dels pocs referents de moda. Sobretot les gegantes: totes les senyores esperaven que sortís la geganta per veure com anava vestida o pentinada i copiar-la. En canvi, els gegants sovint anaven vestits de senyor medieval, amb la porra, la llança i l’escut de la parròquia o de la ciutat. És molt important com els gegants porten els símbols de la ciutat o del poble al qual pertanyen. També era força comú, durant molts anys, veure una geganta molt ben arreglada, i al costat a un gegant amb la mateixa indumentària des de feia trenta anys. És molt interessant observar com la religió (ja que has mencionat que molts gegants pertanyen a les parròquies), la cultura popular i la moda convergeixen en aquestes figures. Sí. Tradicionalment els gegants pertanyien a les parròquies perquè abans no hi havia una diferenciació tan clara entre el món laic i el món religiós, i justament les parròquies complien la funció de centre social. A més a més, els gegants sortien per la processó del Corpus, que era una festa religiosa. Ara surten sobretot per les festes majors, però aquestes no comencen fins al segle XVIII. Avui en dia podem trobar gegants a parròquies, però també a ajuntaments i fins i tot a escoles o cases particulars. Hi ha molts nens que volen tenir el seu propi gegantó! Però d’on surt aquesta tradició dels gegants? Al voltant del 1320 hi ha les primeres referències d’homes sobre xanques. El primer gegant documentat de tot el món va ser el Gegant de la Ciutat, a la Barcelona del 1424. Aquell any va venir el rei a veure la processió i es va escriure tot el que passava, però ja devia fer anys que devien existir per aquí. L’origen dels gegants també és religiós, ja que representaven Goliat en les processons i hi havia algú que feia de David. Després hi ha tot el bestiari que representava a diversos apòstols o personatges de llegendes com ara el Drac de Sant Jordi. A partir d’aquí, la idea del gegant va anar evolucionant amb gegants que representen diferents reis. A Bèlgica i en alguns llocs de França també existeixen gegants, però com a tradició és a Catalunya on més força han agafat al llarg dels segles. No sé per quin motiu ha arrelat tant aquí, potser en part pel gust que tenim els mediterranis per estar a l’exterior. Justament els gegants estan molt vinculats amb la catalanitat. Què va passar amb aquesta tradició durant el franquisme? Bé, durant la guerra en van desaparèixer molts; alguns es van cremar dins de les esglésies o es van destruir. Després, durant el franquisme, es va convertir tots els gegants en Fernando i Isabel, per tal de poder seguir amb aquesta tradició. I, a partir dels anys vuitanta, els gegants van tornar a tenir noms de reis catalans i també va sorgir la moda de fer-ne alguns que representessin personatges coneguts o populars: des de la peixatera de la Barceloneta fins a Gaudí. En aquells anys, l’afició pels gegants es va convertir en un moviment social en què hi participaven moltes famílies: es van fer gegants més lleugers perquè les dones els poguessin portar i van sorgir gegantons per als nens: així tothom podia tenir una funció i participar activament cada vegada que sortien. D’on et ve a tu aquesta afició pels gegants? Quan els veia de petit em feien molta, molta por. Però a poc a poc aquesta por va anar canviant i em va generar interès. Quan tenia sis anys m’agradaven moltíssim. Els meus pares no tenien especial afició, però els havíem vist a les festes. Vaig entrar a la colla de Geganters i Grallers del Clot i després a la colla del Pi. El 2005, quan tenia tretze anys, vaig escriure el text del llibre Petita història dels gegants i gegantes a Catalunya, il·lustrat per la Pilarín Bayés. Ara ets el secretari de la Coordinadora de Gegants de Barcelona. Quina funció té aquesta associació? La coordinadora es va crear el 82. Ja saps que Barcelona, en realitat, és un conjunt de pobles, i que hi ha gegants a cada districte. Totes les parts de la cultura popular funcionen a través d’agrupacions; per exemple, l’agrupació de diables, la d’esbarts, la de pessebristes, etc. La gent que hi treballa ho fa voluntàriament, per afició o per voluntat de continuar la tradició. Nosaltres ajudem les diferents colles perquè puguin continuar amb aquesta tradició. Els ajudem a organitzar intercanvis i que es vagin generant vincles entre elles. Ara mateix, els gegants a Barcelona estan en el seu millor moment. Tenim trenta-dues colles. Hi va haver un moment que per les Festes de la Mercè només en sortien vint-i-quatre, les altres no tenien participants que poguessin treure els gegants o els mitjans per transportar-los fora del seu barri. Ara mateix surten totes les colles! Tenim dos-cents cinquanta gegants oficials a Barcelona, però n’hi ha molts més!